When a large-scale disaster strikes a community, there are a number of essentials that the residents need – food, water and shelter being the most basic. An essential need, for both disaster victims and responders, is information. Internally, the vehicle is set up with two separate work areas, one for public information, and one for the geographic information. Each work area contains two computers with access to a multifunction scanner, copier, fax machine, and large format plotter through an internal network; the public information area also contains televisions and video equipment. A cabinet with network equipment and telephones separates the two work areas. Along with the capabilities of the vehicle, the PI/GI has a team of public affairs and geographic information specialists that can be deployed with the vehicle. To find out more about the public affairs team, please contact the Kansas Adjutant General’s Department Public Affairs Office at (785) 646-0090 or ng.ks.ksarng.list.staff-pao@mail.mil. To find out more on the geographic information team, please contact the Kansas Adjutant General’s Department Geospatial Technologies Section at (785) 646-1550 or michael.g.dattilio.nfg@mail.mil. With the equipment and personnel that the PI/GI brings to an emergency, it can greatly enhance the ability of responders to quickly and effectively manage the emergency. The job of the public information officer is to ensure that accurate and credible information is delivered to the public in a timely manner. With the communication, media monitoring, and computing capacities of the PI/GI, the public information officer can be more effective. Emergencies happen over a large area, making them inherently geographic. The PI/GI and GIS personnel facilitate the ability to create, modify, and print maps on-scene; consequently, allowing responders and emergency managers to quickly make decision on how best to manage the scene. GIS personnel can either directly support a local GIS person or can augment them by allowing the local GIS person to focus on city and county emergency operation needs. Where will the PI/GI deploy? 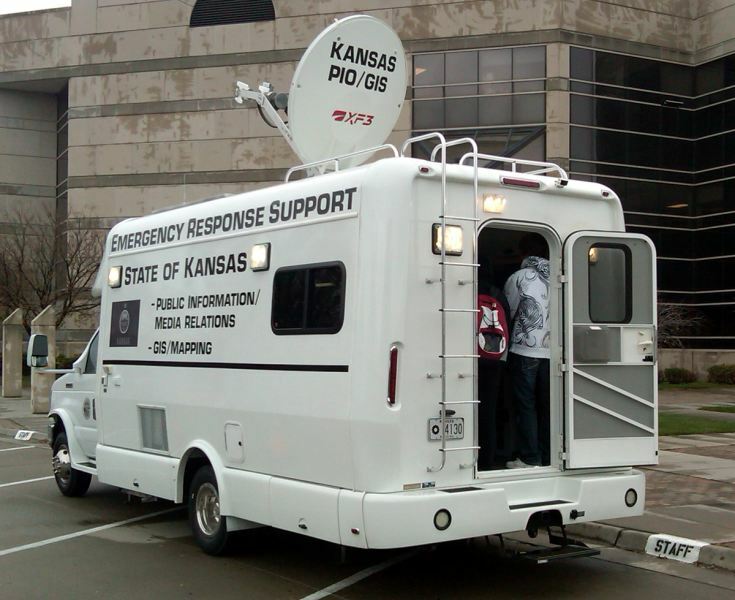 The PI/GI is set up to deploy anywhere in the state of Kansas; however, through the Emergency Management Assistance Compact the PI/GI may deploy nationwide. How is the PI/GI requested? A local emergency management agency needs to request the PI/GI through the State Emergency Operations Center (SEOC). The State Emergency Operations Center reserves the right to reallocate the PI/GI at any time. To request the PI/GI, call (800) 905-7521 during normal business hours. How much does the PI/GI cost to deploy?